President Obama said the work of Russian activists is “critically important” to maintaining an open society during a roundtable he held with civil society leaders in St. Petersburg. Obama met with leaders of two Russian LGBT groups — Igor Kochetkov, director of the LGBT Network, and Olga Lenkova, spokesperson for Coming Out — as part of a discussion he had with a total of nine activists, according to the White House pool report from the New York Times’ Peter Baker. 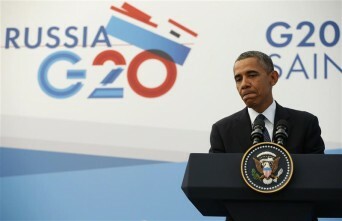 The meeting took place as part of Obama’s visit to St. Petersburg for the G-20 summit. The work of these activists, Obama said, is “critically important” because they help maintain a free society, according to a transcript of his remarks from the White House. Posted September 8th, 2013 & filed under Activism.